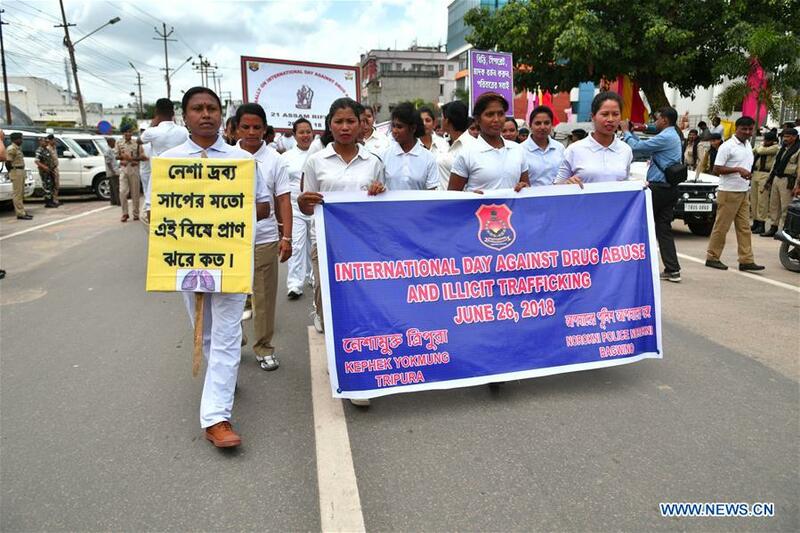 A bike rally organized jointly by various security forces was flagged off by Tripura Chief Minister Biplab Kumar Deb on the occasion of International day against drug abuse and its illicit trafficking. The bike rally in which other than the state police, troopers from BSF, CRPF, Assam Rifles and Tripura State Rifles took part started from the premises of the Rabindra Bhavan. Along with Deb, DGP of Tripura Police A K Sukla and other senior officials of various security forces took part. Addressing the gathering, Chief Minister Deb said that the security forces during the two months tenure of the new government could recover more than what they did in two year’s time of the previous government because their intention was not clean. Terming every woman of the state as an individual home minister, the Chief Minister viewed that if they want in one day they can stop all drugs and illegal activities of the State. He appealed to the women folk to come forward against the drug menace in the State that bloomed during the last 25 years under the Left Front rule as because without government support such illegal business cannot grow. Without naming the former Chief Minister Manik Sarkar, Deb even raised question that how without the knowledge of the head of the government this small state Tripura go up to the second position in drugs? He praised the role of the Tripura Police and other security forces for their success in the fight against drugs to make the state a drugs free state. Deb also recalled that on this day in 1975 the then Prime Minister Indira Gandhi has murdered democracy by imposing emergency to stop the opposition. Meantime, DGP Sukla said that as the Chief Minister has set a target to make Tripura into a drugs free state, the moral of the Tripura Police along with other security forces are high and has a mission and single focus to make the state drugs and corruption free. He also said that in this mission the common people of the state has also come forward and helping the police with information against the drug peddlers and criminals.